An unparalleled race destination weekend. After the race, take some time to enjoy the historic city of Hollywood! Visit the walk of stars, Beverly Hills, or Mann’s Chinese Theatre. World-class dining, shopping, wine tasting, a visit to Universal Studios and much more. Although a very tough course this is a walker friendly course that welcomes 10K walkers. The Griffith Park Trail 10K is the SECOND of TWO races in the Hollywood Trail Rock Star series. Run the Griffith Park Trail Half Marathon and the Griffith Park Trail 10K on the same weekend, and become a Hollywood Trail Rock Star. Rock stars will receive a rockin’ series commemorative medal and bragging rights to boot. Take the Los Feliz Blvd exit. Drive west a short distance to Crystal Springs Drive and turn RIGHT. Follow Crystal Springs Drive until you reach the stop sign at the intersection of the Ranger Station Headquarters and Fire Road/Crystal Springs Drive. We will have signs here! Go LEFT here, and follow back to the parking lot near the merry go round. Please note the start of this race is NOT anywhere near the start of our half-marathon. Completely opposite sides of the park. The 10K starts near the OLD L.A Zoo, and Carousel/Merry Go Round. Friday before race day, 3:30pm-7:30pm. Check-in is at the start/finish area starting at 6am. Tough and rugged trail 10K. See the Course Info section for turn by turn directions. 3 hours. Race course closes at 10am. No exceptions. Every runner receives a beautiful finisher’s medal, & a nice tech shirt.If you complete both the half marathon and 10k you will be able to pick up your special Hollywood Trail Rock Star medal and shirt immediately following your 10K finish at the start/finish line. NOT before the race. A delicious breakfast will be served starting at 8am at the start/finish area, and is free to all runners and volunteers. 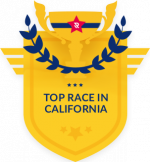 The race will be accurately chip timed with results posted live on race day. Parking will be in the parking lot near the merry-go-round. Parking lot will be open at 5:30am. No earlier.